Middleton Lodge is a very special North Yorkshire wedding venue and it’s a place that we very much enjoyed photographing. We aren’t the only ones to have this opinion either, as on Monday this charming venue got voted Best Wedding Venue in the North East (congratulations guys!) and as we were the winners of the Best Wedding Photographers in the North East, we got the opportunity to visit it again whilst being interviewed. It was so lovely to be back there as we had so many wonderful memories of our first visit, only a few short weeks ago at Sophie and Stuart’s wedding. This fantastic, relaxed couple had a tremendous day planned out for the guests and we loved being there to photograph every moment. In the morning the men went off to test their nerve with some clay shooting and hilarious banter, whilst the girls all chilled out in the bridal suite drinking champagne and swapping stories. Then came the emotional ceremony which was outdoors in the gorgeous grounds of Middleton Lodge, and as Sophie and Stuart gave their heartfelt vows the guests all cheered and showered them with confetti as they walked back up the path as husband and wife. After some brilliantly comedic speeches (our favourite bit was when the best man emerged with two photographs, one of a younger Stuart and the other Coronation Street’s Bet Lynch!) 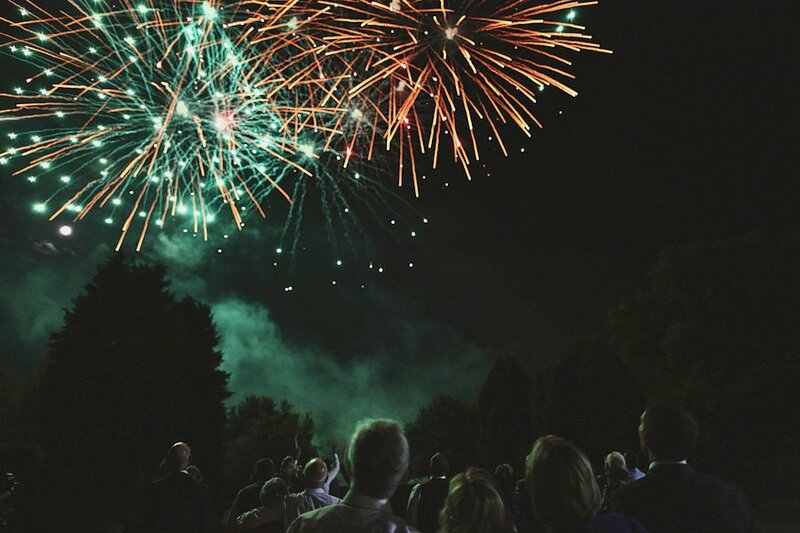 the guests were treated to a live band and, as a surprise, some spectacular fireworks which had everyone whooping! Thanks so much to our amazing couple and the fantastic hospitality of Middleton Lodge, we had an utter blast. Here are some of our favourites, more coming soon! Middleton Lodge wedding photographers, Dominique Shaw and Liam Shaw are the creative partnership behind York Place Studios and strive to create emotional, storytelling photography that captures the real moments of your wedding day. Based near York and Leeds, the destination wedding photographers travel across their home county of Yorkshire, the UK, Europe and worldwide to capture your special moments. Cool beans! Kid with the spoons is just ace. aww! Wow, some really fantastic and intimate moments you’ve captured :) great job! Love the one with the boy and all the men. So fun! Good stuff, love the Bet Lynch photo in the speeches! Gorgeous work and beautiful venue! Congraulations! Great coverage. Love the petal/confetti shot! So many beautiful creative moments captured! Well done I loved looking through them! Beautiful wedding of a beautiful couple. wow so many spectacular moments. this seriously has my jaw on the floor. AMAZING work. Awesome wedding! Love the image with the groomsmen and the little boy. Also, such fun dance pics! Really love the mood evoked in these wedding photos. Super well done! Awesome sauce as always guys! Gorgeous job at capturing the emotions of the day! It all really feels like I’m right in there with the guests.